Stir-Fried Squid With Roasted Chili Paste or Pla Meuk Pad Nam Prik Paw. This Thai roasted chili paste recipe is red hot! Check your spice-o-meter when preparing this paste, adding less fresh chili if you prefer less spicy dishes. Roasted Chili Paste makes for excellent Thai chili paste. Add squid and onion together, stir quickly until nearly cooked. Be careful not to overcook. 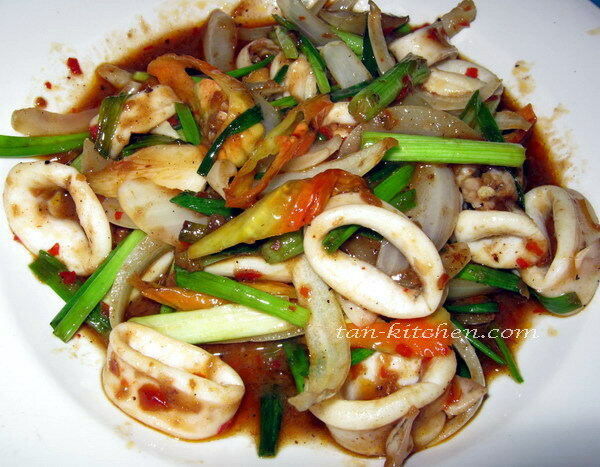 You will get the best taste of squid only when the squid is nearly cooked. Add roasted chili paste, soy sauce, green onion, chilies, sugar and stir fry for another 2 minute and until all ingredients mixed well. Garnish with coriander leaves on top and serve immediately with steamed rice.